This strapless dress is made of a gorgeous oversized crochet lace we love! The Happily Ever After Strapless Crochet Lace Dress is fully lined. It has a strapless sweetheart neckline with a dip in the center of the bust. The empire waist gives way to the skirt with a classic sheath cut. We love how the lace at the bottom of the skirt gives it an uneven scalloped hemline. A hidden back zipper completes this dress. The Happily Ever After Strapless Crochet Lace Dress looks perfect paired with beige pumps. You could also try wrapping a black fabric sash around the waist for contrast and pairing it with black pumps and accessories for a chic look. This would make a cute rehearsal dinner dress or bridal shower dress. Details: Made in USA. Fully lined. Hidden back zipper. 100% polyester. Lining: 100% polyester. Hand wash cold or dry clean. Small measurements: Length from top of bust to hemline: 32". Bust: 32". 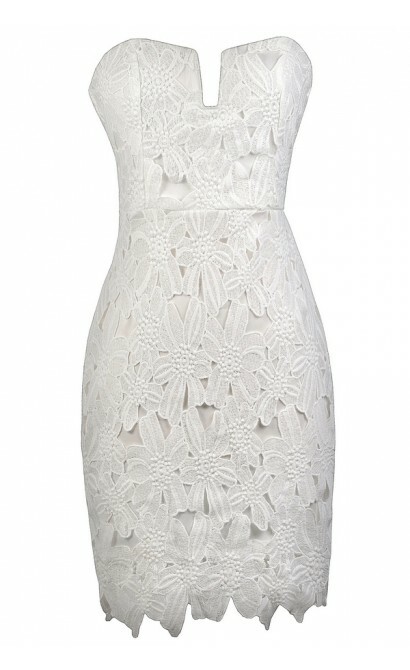 You have added Happily Ever After Strapless Crochet Lace Dress in White into Wishlist. You have added Happily Ever After Strapless Crochet Lace Dress in White for Stock Notification. You have set Happily Ever After Strapless Crochet Lace Dress in White as a loved product. 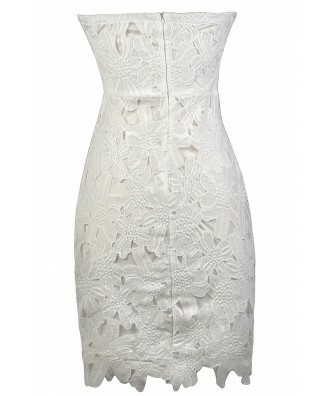 You have removed Happily Ever After Strapless Crochet Lace Dress in White as a loved product.